For the uninitiated, Viz magazine is one of the funniest, most original publications ever to hit the newsagents shelves in the UK; an adult comic strip which started life way back in 1979 but hit the big time in the mid-1980s, Viz features an array of brilliantly visualised characters – your author’s personal favourites was always Student Grant. So it’s high time we saw an online slot based on some of the best-known characters from over the years and fortunately Blueprint Gaming have taken on the task. 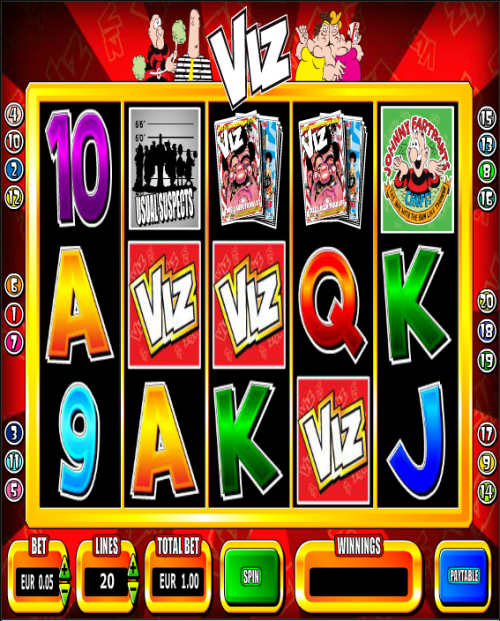 Viz is a five reel and twenty payline game which uses the standard playing cards as the low value symbols while the higher value ones are all connected to the comic. We have the Viz comic, the logo, a ‘since 1979’ logo, a super wild and the following characters – Roger Mellie, Johnnie Fartpants and a symbol which includes the silhouettes of a number of characters (Usual Suspects). Roger Mellie Bonus Show – land three, four or five of the Roger Mellie symbols and you’ll win either 50, 100 or 200 free spins. Within the bonus game you can randomly win more spins with the Gameshow Bonus. Johnny’s Wheel of Fartune – Johnny Fartpants is our hero here and by spinning three, four or five of his symbol you’ll play his bonus game. Each reel containing the symbol changes into a Wheel of Fartune and will spin to reveal a multiplier. All multipliers will then be added and applied to the original win. Usual Suspects Bonus – Land three, four or five of this symbol and you’ll get the chance to click one of the characters to reveal a multiplier; the characters to choose from are Biffa Bacon, Roger Mellie, the Fat Slags, Johnny Fartpants and Sid the Sexist. The biggest possible multiplier is worth 500x your original wager. If you like Viz then you’ll love this game; everything about the design of the slot will remind you of the comic and the bonus games make the most of the characters idiosyncrasies. We’d like an Autoplay feature but you can’t have everything. You can bet as little as £0.01 per payline all the way up to £200 per spin with everything maxed out.